Governor Greg Abbott (R), and former Dallas County Sheriff Lupe Valdez, squared off in the Texas capital for the gubernatorial debate on Sept. 28. Gun violence, immigration and healthcare were at the forefront of issues discussed by the candidates. It was a somber event compared to the Texas senatorial debate a week ago. The first topic: mass shootings. 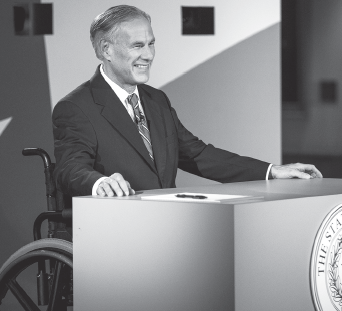 Greg Abbott raised his hand when asked if candidates wanted teachers to be armed in schools. Incumbent Greg Abbott (R), left, and Democratic challenger Lupe Valdez debate in the LBL Library in Austin on Sept. 28. Lupe Valdez was against arming teachers in schools. On immigration, the Texas DREAM Act was one area that was targeted during questioning. Abbott was asked about a statement he made in 2014. He told the Texas Tribune that he would not veto a repeal of the Texas DREAM Act. According to the U.S. CENSUS, 4.8 million Texans don’t have insurance. Abbott cited the progress Texas has made. He pointed out the drop in numbers of uninsured Texans. Abbott believes Texas is improving health care. Valdez believes that enough hasn’t been done to reduce the uninsured in Texas, accusing Abbott putting Texans with pre-existing conditions at risk. “One in six Texans do not have health insurance. We are the highest uninsured state in the United States yet Texas leads the attack on preexisting conditions. Yes, he put in a system. In the system there was no accountability, there was no measurement and as you saw time-and-time in the media, it was profit over pain and all those thing,” Valdez said. “Gov. Abbott will you stop your attack on pre-existing conditions?,” Valdez asked at the end of her response. Abbott and Valdez debated over several other topics ranging from property taxes to the bathroom bill. You can watch the debate at nbcdfw.com and keranews.org. The election will take place on Nov. 6.